Hello and welcome to Big Red Sports; the home for the best Kia service and assistance in the Norman area. Whether you are in need of an important repair or simply partaking in a scheduled tune-up, there is no denying that the Big Red Sports staff of devoted Kia qualified mechanics are excited to offer up their abilities to you during this significant (and highly important) time. Even if you drive an automobile that does not belong to the Kia line of offerings, we would be more than delighted to offer up our services to you. The men and women who proudly make up Big Red Sports's expert staff of service and repair specialists are well-versed on plenty of makes and models outside of Kia, so you can rest easy knowing that your non-Kia vehicle is in good hands once you roll onto the Big Red Sports property. Before considering any other alternative, feel free to join us and get to know why so many of the great people of Norman will not take their automobiles in for service and repairs anywhere else. After taking the time to do this, odds are that you will be ready to get the ball moving on your service requirements and lay out a trip to Big Red Sports in the near future. Safeguarding Your Wellbeing Via an Unequaled Devotion to Superb Repair Techniques – The Big Red Sports staff takes your safety seriously, so you can hit the streets of Norman with confidence knowing that we will do whatever it takes to get your car back in action in as quick and safe a manner as possible. Taking Care of Your Budget Concerns – Looking for the number one vehicle service in Norman, all at a fair and affordable price? Then make a trip to Big Red Sports and you will soon see just how serious we are when it comes to keeping you on point with your budget. Replacement Components That Adhere to Strict Quality Standards – Are you looking to bring your Kia car to the Big Red Sports service team? Then you will be happy to know that we have access to all of the industry-leading original equipment manufacturer (OEM) parts required to handle your distinct service problem. Once you put all of this together, it is plain to see that Big Red Sports is the preferred choice in the Norman OK region for shoppers who want to make the most of the perfect blend of excellent service, premium support, and affordable repair rates. 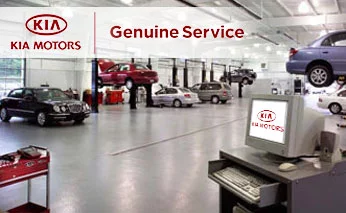 Taking a deeper look, Big Red Sports is not just the most affordable and trustworthy service provider in town, but also the home to the most experienced collection of Kia accredited mechanics. While you might be questioning the need to turn to the finest crew of Kia mechanics here in Norman, the reality of the situation is that the years of hard work and instruction undertaken by these men and women effortlessly supersedes what you will find at any of our nearby competitors. Naturally, it is not unheard of for these smaller companies to make use of cunning or enticing sales tactics and showmanship in an attempt to court unsuspecting consumers. Even so, there is no escaping the reality that only accredited Kia professionals have spent the countless hours necessary to receive this honored status from Kia. Likewise, attaining this position also comes with the ability to engage directly with Kia and stay abreast with all of the most recent news and insight into Kia cars and the best repair and maintenance treatments. When it comes to keeping your automobile in peak condition, are you honestly willing to agree to anything less than the excellent support and raised requirements that come with work completed by a licensed Kia specialist? Oil Changes – Leaving old, dirty, and otherwise spent oil in your motor can lead to elevated friction and the inevitable degradation of crucial parts. Tire Rotations – Bald spots and avoidable wear and tear, as well as a greater risk of accidents, are all warning signs of tires that are not rotated on a regular basis. Timing Belt Changes – An overlooked timing belt is similar to an impending disaster in that it can cause severe damage to a car's motor if it gets to the stage of acute degradation and falters during your daily routine. Brake Inspections – Even though most things related to your brakes might come across as boring or mundane, setting aside a few moments to examine these essential components on a regular basis ensures that they are ready to work properly when you need them most. The message here? Skipping out on the regular upkeep your vehicle desperately needs to stay in running order is never a strong choice. The sustainability of your car (and your finances) is at risk, so make it a point to reach out to Big Red Sports when the time comes to deal with these often uncomplicated services. Now that you fully recognize how imperative handling your recommended maintenance with a dependable institution like Big Red Sports is to the longevity of your vehicle, there is no better time to work with our skilled team and craft an ideal service schedule. To get the ball rolling on this front, go ahead and give our group of dedicated and Kia-trained automotive experts a call at (405) 364-4400 today. By deciding to tackle your service requirements with the assistance of the crew here at Big Red Sports, you will be taking a great step toward extending the useful life of this vital resource. When you fully grasp how imperative it is to have an automobile in proper working order to keep your regular schedule on track, and your time devoted to journeying outside of Norman, it makes all the sense in the world to get with the Big Red Sports crew at once and get back on track with your routine service schedule as soon as possible.